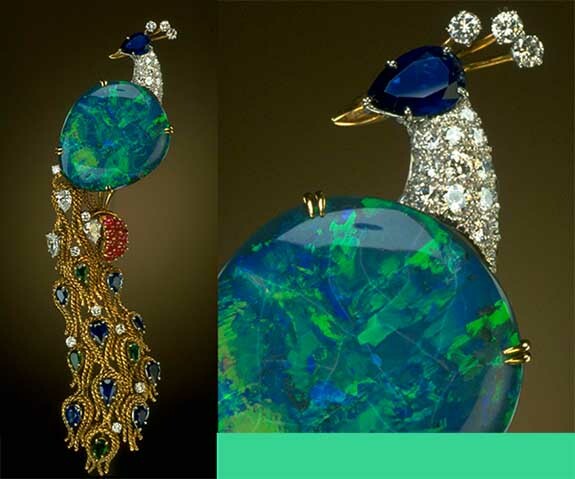 Gifted to the Smithsonian in 1977 by legendary jeweler Harry Winston, the “Opal Peacock” brooch showcases a 32-carat black opal sourced from Lightning Ridge, Australia. The cabochon-cut gem, which displays a vivid blue and green play-of-color reminiscent of a peacock’s plumage, is considered one of the world’s finest examples of October’s birthstone. For his Opal Peacock brooch, Winston adorned the kaleidoscopic center stone with sapphires, rubies, emeralds and diamonds set in 18-karat yellow gold. The impressive piece is currently on display at the National Museum of Natural History in Washington, D.C. The black opal — characterized by a blue, gray or black body color — is regarded as the king of the opal world. Lightning Ridge, a small outback town in New South Wales, is the only place in Australia, and one of the few places in the world, where the highly prized black opal is found. Other varieties include white opals, boulder opals, crystal opals and fire opals. According to the Smithsonian, opals can form only when an undisturbed space in a rock holds a clean solution of silica from which water is slowly removed over a period of thousands of years. The opals consist of transparent spheres of silica that are tightly packed. The voids among the spheres contain only air or water. In precious opal, the silica spheres are uniform in size and are stacked into an orderly arrangement, which gives the structure the ability to break visible white light into separate colors. Interestingly, an opal’s silica structure contains 3% to 20% water, according to the American Gem Society. Since opal was first discovered in Australia circa 1850, the country has produced 95% of the world’s supply. Scientists believe that the abundance of opal can be traced to a vast inland sea that once covered a large portion of Australia. As the sea regressed, a rare episode of acidic weather was taking place, exposing pyrite minerals and releasing sulphuric acid. As the surface of the basin dried further and cracked, silica-rich gel became trapped in the veins of the rock. Over time, the silica solidified to form opals. Even though Australia is the world leader in opal production, the October birthstone is also mined in Mexico, Brazil, Honduras, Ethiopia, the Czech Republic and parts of the U.S., including Nevada and Idaho. Credits: Photos by Chip Clark/Smithsonian.